FREE Initial Podiatrist Consultation - a $249 value. $200 DISCOUNT on Toenail Laser Treatments - laser is one of the most effective ways to clear up nail fungus, even when other treatments have failed. 50% OFF ShoeZap® - your own ultraviolet shoe sanitizer to kill germs, bacteria and fungus that could be lurking in your shoes at home! Normally $90, but only $45 when you join the Laser-Plus Club by 4/30/19. 50% OFF Quality Antifungal Topicals for your nails. Regular price before discount is $33.50. 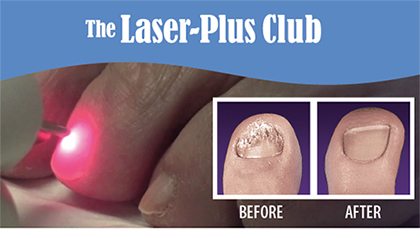 Registration for the Laser-Plus Club is free, but only available through 4/30/19. To sign up, just complete and submit the form below to request your initial consultation. Questions? Give us a call at 804-320-FOOT (3668). We look forward to hearing from you!